INDIANA -- An Indiana man has been sentenced to 18 months in prison after admitting he forced his 7-year-old daughter to stab the family cat to death. During his sentencing today, Daniel Collins said he was "extremely sorry" for his actions. The judge in the case told him it wasn't "civilized conduct." In exchange for a guilty plea on animal cruelty and two counts of neglect, prosecutors dropped three other felony charges against the 39-year-old. Collins' daughter and his 11-year-old son said Collins ordered them to stab the cat in March because he wanted them to "learn to kill." 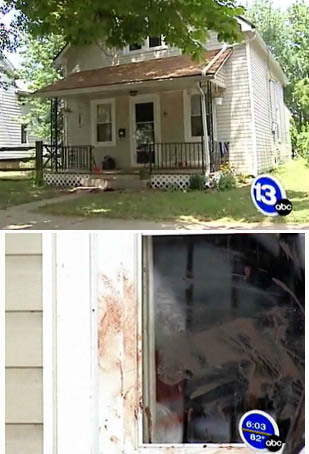 Police say the boy tried to hide the cat, but Collins found the animal and strangled it while his children watched. Collins says he was intoxicated at the time and remembers little about what happened that day. OKLAHOMA -- An Oklahoma City man was arrested last week for allegedly kicking a puppy. 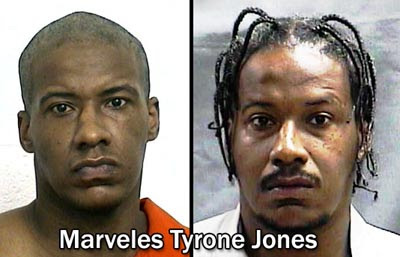 Marveles Tyrone Jones, 32, was arrested Aug. 16 on a complaint of animal cruelty, police said. Jones approached a neighbor in her front yard and asked to borrow a cigarette lighter, according to a police report. After using the lighter, Jones asked for an alcoholic drink. 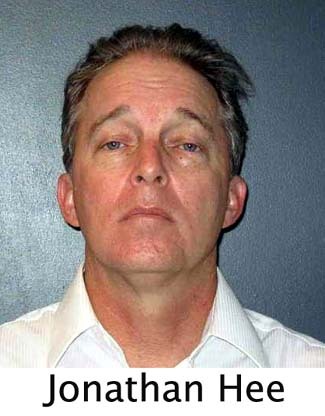 When the neighbor refused, Jones walked away and kicked the neighbor's 9-week-old dachshund border-collie mix into the street, according to the report. Vermont: Pauline Harpin, 70, and son Paul Harpin, 41, accused of "Worst Case Of Animal Abuse in Vermont"
VERMONT -- Responding to a report of animal cruelty, authorities found dozens of living and dead animals in a home infested with fleas, maggots and rotting carcasses. 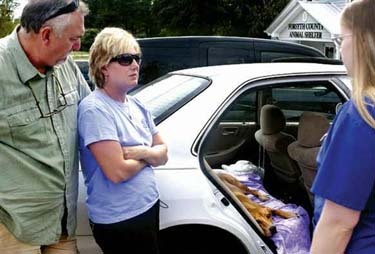 The owners - a woman and her adult son - were charged with animal cruelty. "It has to be the worst case of animal abuse in the history of Vermont," according to Animal Control Officer Josephine Guertin. Five cats, two ferrets, a lizard, a gecko, a rabbit, a python, a gerbil, a tarantula, a chinchilla, a guinea pig, a tortoise, a mouse and a malnourished dog were rescued. Found dead were an iguana, a white rat, a hedgehog and at least 15 cats and kittens in various stages of decomposition. Also found was a decomposing animal of unknown type in a pot on a stove. More than a dozen partially frozen dead animals were found in a refrigerator freezer. The animals had been denied food and medical care, according to Sgt. Bill O'Hare, of the Caledonia County Sheriff's Department, who responded to the scene. Pauline Harpin, 70, and son Paul Harpin, 41, were charged with animal cruelty and cited into Vermont District Court on Sept. 8. "The stench was overwhelming, between the urine and feces," said O'Hare. "As soon as you step in, you're covered head to toe with fleas." On Wednesday, O'Hare and three deputies served a search warrant on the house after receiving a report of severe animal cruelty and threats allegedly made by Paul Harpin to shoot anyone who tried to take the animals. Inside, they found neglected animals including a 4-year-old Labrador mix who had apparently been living amid filth and water in a basement since it was three months old, Guertin said. "She's as starved for affection as she is food. She still has diarrhea," Guertin said. One cat had an upper respiratory infection, and a tortoise was found with a deformed shell, according to Guertin. Pauline Harpin, who was covered in flea bites, had to be decontaminated by a hazardous materials crew before being taken by ambulance to Northeastern Vermont Regional Hospital in St. Johnsbury, where she was treated and released. Guertin and a veterinarian who responded to the scene also had to be decontaminated, according to O'Hare. The Harpins signed voluntary surrender forms allowing the live animals to be removed and adopted once they are rehabilitated. For now, the animals are in town custody. The Harpins, meanwhile, are staying at a motel after being advised to stay out of the house until it is cleaned, according to O'Hare. "They said they didn't know why their animals were dying. They were very angry we were taking the animals away from them, and they didn't offer any information. They simply said `We're taking care of them, but they're dying, there's nothing we can do.' The response they gave was very strange," O'Hare said. Animal cruelty is punishable by up to $2,000 in fines and a year in jail. 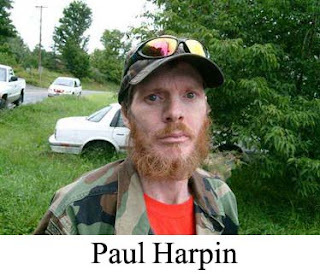 VERMONT -- Paul Harpin, 41, Passumpsic, was arrested for cruelty to animals Wednesday after the Caledonia County Sheriff's Department investigated a complaint from St. Johnsbury animal control officer Jo Guertin. Sgt. William O'Hare applied for and obtained a search warrant for the property at 4756 Route 5 in Passumpsic. With O'Hare were deputies Gaylon Smith, Dana Kallahan and Steve Hartwell. Also responding with the officers were Guertin and veterinarian Robert Hicks. Guertin said she called the sheriff's department because she had heard Harpin had said anyone who tried to take any of the animals would be shot. 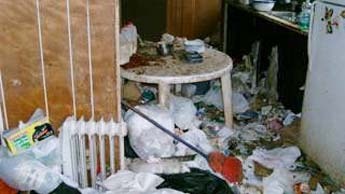 Upon serving the warrant, O'Hare found the one-story home to be filled with rotting garbage covering every inch of the floor and furniture. The entire house was filled with fleas, flies and maggots, feces and urine - and many animals were in various stages of neglect, according to O'Hare's report. Guertin and Hicks spent five hours inside the house locating and removing the animals which included at least four cats, a guinea pig, mice, a chinchilla, a tortoise, a rabbit, ferrets, lizards, a python, and several other animals. Found in the home's basement with no food or water was a a severely emaciated, and near death, 4-year-old Labrador retriever mix dog. 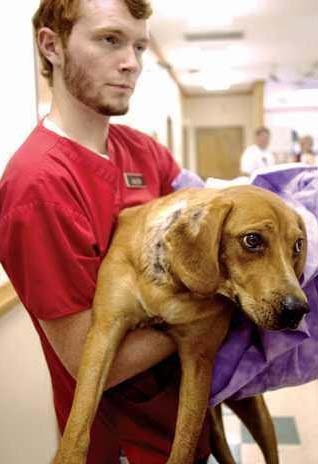 The dog's condition was so poor he needed to be carried from the house as he was unable to walk. Also found in the house was a dead and decomposing cat in a plastic bag on the floor, two dead and decomposing kittens in a cardboard box and approximately 14 dead animals partially frozen in a freezer, including a hedgehog, iguana, kittens and cats. "This is the worst case I've ever seen," Guertin said Thursday. "It has to be the worst case of animal cruelty in the history of Vermont." Harpin arrived home just as deputies had arrived. As a result of the findings in the house, O'Hare placed Harpin under arrest for cruelty to animals. Harpin is due in Caledonia District Court Sept. 8. With Harpin was his 70-year-old mother, Pauline Harpin. 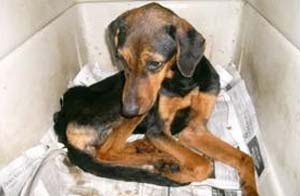 Pauline Harpin appeared to be covered in fleas and suffering from uncountable flea bites, O'Hare said. He called CALEX Ambulance to come and check her out. Rescue workers in turn asked the St. Johnsbury Fire Department to respond with its decontamination unit. After she was washed down, Pauline Harpin was taken to Northeastern Vermont Regional Hospital in St. Johnsbury for treatment. Firefighters also decontaminated Guertin and Hicks, O'Hare said. "The fire department was very helpful," he said. The department also provided protective suits and filtered masks to Guertin and Hicks. Guertin said Thursday she has found foster homes for some of the animals, but desperately needs homes for the cats. She also said the cost of care and feeding of the animals would be expensive. People who would like to donate food or cash should call Guertin at 748-4230. Interested parties could also make a donation to the animal's care through the "Rosie Fund," which is a charitable entity created by Guertin in memory of a stray for which she cared. Donations should be sent to Bank North on Railroad Street in St. Johnsbury. O'Hare said he will be continuing the investigation into the animal cruelty and other various aspects of the case. ALL I HAVE TO SAY IT IS ABOUT TIME, SOMETHING HAS BEEN DONE. THEY HAVE BEEN REPORTED MANY TIME, BUT NOTHING WAS EVERY DONE. IT IS TO BAD,MAYBE SOME OF THE ANIMALS COULD OF BEEN SAVED. GEORGIA -- It appears the man charged with shooting a dog last week in a northwestern Forsyth subdivision has had frequent run-ins with his neighbors. Jonathan Hee, 51, of Green Summers Drive in the Green Summers subdivision, was arrested Thursday and charged with aggravated cruelty to animals, disorderly conduct, reckless conduct and discharging a firearm from a public road by the Forsyth County Sheriff’s Office. The aggravated cruelty charge is a felony. Sheriff’s Capt. Frank Huggins said Hee was released that night after posting a $3,250 bond. 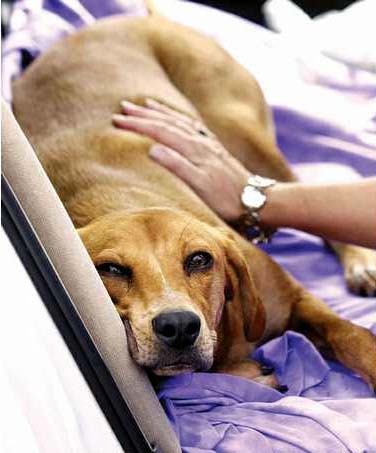 According to a sheriff’s report, Hee was on a walk in the Green Summers neighborhood when Buster, a 50-pound Labrador-beagle mix, ran out from his yard and approached Hee. 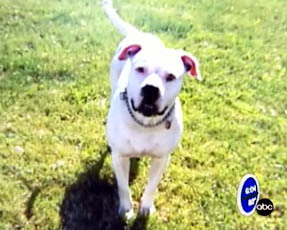 Buster’s owner, 23-year-old Laura Hanson, chased Buster to the road and grabbed him by his harness, the report said. Hee yelled profanities at Hanson as she approached and reportedly pulled a small-caliber handgun out of his pocket and aimed it at the dog. Hanson said Hee then shot Buster three times, wounding him in the neck, ear and chest. Hanson said Buster barked at Hee on Thursday because he was screaming at her. According to the report, Hee said he was defending himself from the dog. “Mr. Hee stated multiple times that he wished he had not shot the dog and would wait until a dog bit him in the future before shooting one again,” the report said. Hanson said it’s a miracle Buster is alive. Although he is expected to survive, she said she can’t look at him without crying. A woman who answered the phone at Hee’s residence declined to comment on the matter. Hee was not there, she said, and has not hired a lawyer. Susan Tesone lives next door to Hee. She said she has had problems with him in the past and that he has complained to authorities about her two schnauzers. According to a sheriff’s report filed in December 2006, Hee contended the dogs were barking and asked the deputy who responded if the dogs were barking enough to break county ordinances. Tesone said she had left her dogs in her fenced-in backyard that night and was gone 40 minutes. When she returned, a deputy was parked at her house. “He told me that when he pulled up the dogs were not barking and that the dogs did not bark until he went through the back fence and shined a light in the backyard,” she said. Tesone said one of her dogs was treated in spring 2007 for what her veterinarian thought was poisoning. About a month later, Hee complained again about the dogs. The deputy noted it seemed Hee was threatening to kill the dogs. Sandy Dwyer, who also lives in Green Summers, said she was outside talking to a neighbor when the shooting occurred. Dwyer said she heard three pops and thought at first they were fireworks. The sheriff’s report listed the weapon as a Ruger LCP .380, but did not indicate whether Hee had a license to carry the weapon. 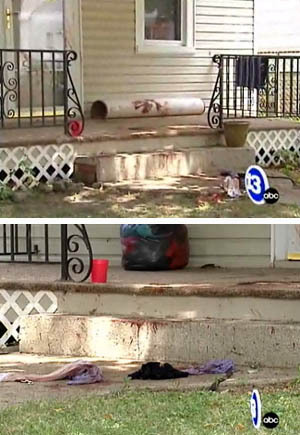 The report indicated the weapon was still loaded and holstered when found at Hee’s house. Dwyer recalled an incident about a year ago where Hee came to her house and introduced himself. She said he then started asking her if she had heard Tesone’s dogs barking. She said Hee told her he had 1,500 hours of video footage of the dogs and how often they barked, but authorities wouldn’t listen to him anymore. She said he asked her if she would also complain in order to have something done about them, but she told him no. NORTH CAROLINA -- The victim's father says his son's injuries are so bad it looks like a shark bit him. A local man is viciously attacked in his own home by his dog. It happened on East Lake Street. 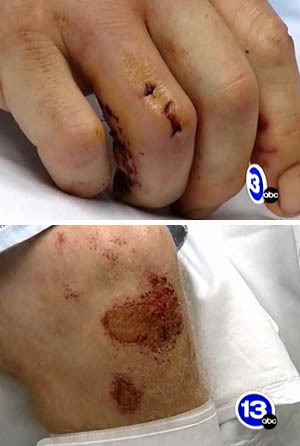 The victim's father says his son's injuries are so bad it looks like a shark bit him. He says the dog bit his son last week, and that his son was going to have the dog put down. 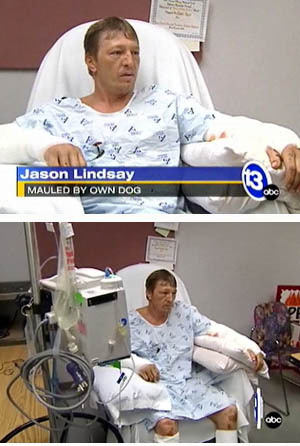 The dog attacked Jason Lindsay after he got out of the shower. "All I had on was a pair of underwear and like I said I went the other way where he was. I came out and when he barked I said Bruttus. He turned around like that and just about that loud too and he just rah, rah," says Jason. The dog lunged at him and locked his jaws onto his hand. Jason says he knew he was in for the fight of his life. He suffered multiple deep bite wounds to his back, legs, and arms. "He completely tore the artery in half in this arm, luckily the next bite he pierced it enough to where it closed it and I didn't bleed to death right there," explains Jason. Jason's girlfriend called 911. With the dog still devouring Jason's arm, he told police to shoot it. "I don't care about the dog, believe that. That dog tried to take my life. I still can't believe he did it. I actually had a mouth full of hair from where I was biting his face. I had to try and fight back." The owner says the dog bit him last week, he was going to have it put down, but then this happened. He doesn't know what made the family pet -- a pet he says was like a son -- attack. "I've always liked them but this is one of them ones that they talk about that snapped, and he snapped." 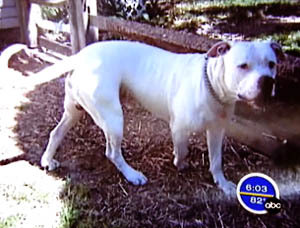 Jason says he's heard all of the stories about pit bulls, but he never thought his American bull dog, which is considered a pit, would harm a fly. Tonight he has a strong message for people who own one of these dogs, "If you're going to have a dog like this you might want to keep a firearm because that was the only thing that got this dog off of me." GEORGIA -- On Monday, July 14, Upson County Animal Control received a call about a possible case of animal abuse at a rental property east of town. Animal Control Director Smart Web was the officer to take the call. Web decided to take a closer look at the situation before taking any action. He (Web) and one of his animal control officers drove over to the residence at 1105 Trice Cemetery Road later that day to have a look around. 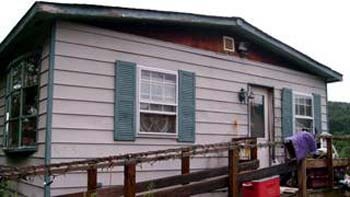 The property, which was rented to Phillip Powell, was not inhabited. According to Web, Powell rented the property on Trice Cemetary Road but resided elsewhere. Web says that from the beginning of the investigation it was clear that the animals weren’t being cared for regularly. Furthermore, he goes on to say that it appeared the house had been abandoned, meaning the dogs hadn’t been tended to for quite some time. According to Web, there were three dogs on the property. All were Pit Bulls; one black female, one black male and a red brindle male. All dogs appeared to be without food and water, and the brindle had no shelter. After two weeks of close observation with no appearance from the dog’s owner, Web decided to take action and confiscate the animals. Director Web, Animal Control Officer Phillip Hill and Sheriff Deputy Murphy, went to collect the dogs the following Friday, July 25. He went on to say that he assumed the female had broken free in search of food and water. According to Web, the officers followed the female around the house to the back and found the other two Bulls still tied with chains. 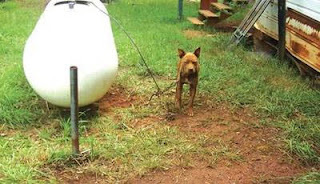 Both restrained animals were still without food and water, and the brindle was still without shelter. All three animals have been relocated to the Upson County Animal Shelter, and are being cared for by Web and his fellow animal control officers. Powell turned himself in on Thursday, July 31 and was charged with one count of cruelty to animals. Investigations into this case are still ongoing. For any information on adopting these or any other pets, call the Upson County Animal Shelter at 706-647-5586.